List of GBA ROMS -> These Gameboy Advance Games can be downloaded from the Internet as gba rom files. People have backuped them using Flash Advance Linker, FA Linker Xtreme or Flash2Advance. [Most likely .gba files will be zipped in .zip files] We do not carry commercial GBAroms on our website because of Legal issues connected with them. Download gba roms from websites that you can find with Google. We do have links to Freeware / Public Domain gameboy and gbc roms that are fully legal. 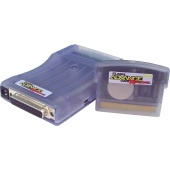 In our website we concentrate on informing people about hardware that will let you make Gameboy Game backups and more important > hardware that will let you play roms that you download from the internet on GAMEBOY ADVANCE instead of emulating it on PC. Nothing compares to playing the roms as they were meant to play!